Many people regularly use scrubs when they shower. Scrubs are made using large mixers that mix all the ingredients. The containers are then filled with this mixture. Canadian researchers from McGill University in Montreal hypothesised that nanoplastics could form from the plastic microbeads that are used as an ingredient during the mixing process. They purchased three bottles of scrubs to test this. The three bottles with plastic microbeads indeed contained nanoplastics that arose from the mixing process. The scientists found that there were at least 300 billion nanoplastics per gram of scrub and that the nanoplastics were between 24 and 52 nanometres (one nanometre = one billionth of a metre) and that they represented 0.03% of the weight of the plastics in the scrubs. They could also determine that the nanoplastics are made from polyethylene, just as are the much larger microbeads. 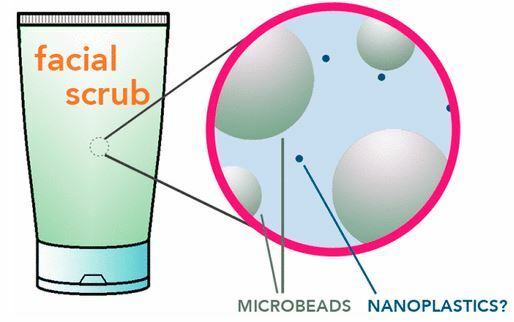 This is the first time that the presence of nanoplastics in scrubs containing plastic microbeads has been demonstrated. The scientists also point out that scrubs are used directly on the skin and that users come into direct contact with nanoplastics. The nanoplastics could enter the skin and damage the body’s cells. There is no legislation anywhere to prevent this. The research was published in the scientific journal Environmental Science & Technology.